The Sixers play all home games at the famed Wells Fargo Center. The state-of-the-art facility hosts thousands of events from NBA to NHL games with the 76ers and Flyers, to Family shows and spectacular live concert performances. The venue boosts a large floor and arena seating perfect for meetings or dinners, small rooms for break-out sessions, and private luxury spaces available for elegant affairs! In the past, we have hosted corporate meetings, a bar mitzvah dance party, product-launch seminars, cocktail parties, and more! Visit www.nba.com/sixers/groups to get more information on how to reserve the Philadelphia 76ers' facility for your meeting or event. 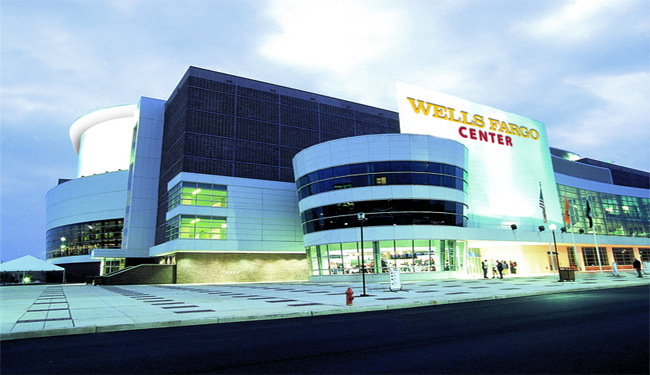 The Wells Fargo Center, home of the 76ers, is a state of the art venue, with many options to choose from. Bring your team to see our team!